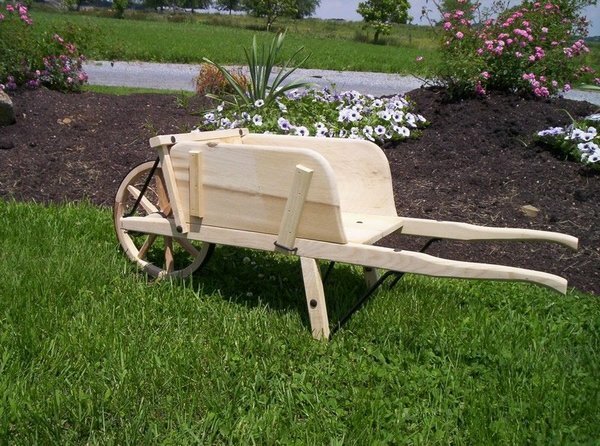 The Amish way of life relies on rustic materials and traditional tools, making them world experts in wheelbarrows! This small decorative wheelbarrow has a fully-functional front wheel and is perfectly proportioned for use as a planter in a garden, on a patio, or as part of a deck. The optional galvanized metal liner is designed to ensure that the wheelbarrow stays strong and beautiful through years of use as a planter - leave it out if you have other plans for this outdoor treasure. You can further customize this wheelbarrow by adding a hand-paint murals on the sides. If you are interested in learning more about the hand-painted mural option, please give us a call at 1-866-272-6773. Some simple assembly is required for this wheelbarrow as shipping it assembled is very expensive. I received the hardware Monday. Thank you for the service! The wheelbarrow is going to be a center piece for the Easter garden display! It arrived just in time!